Black Walnut (Juglans nigra). Also known as walnut, American black walnut, American walnut, Canadian walnut, black hickory nut, gun wood, canaletto, nogal, and tocte. Type: Hardwood. Sources: Grows in United States and Canada. 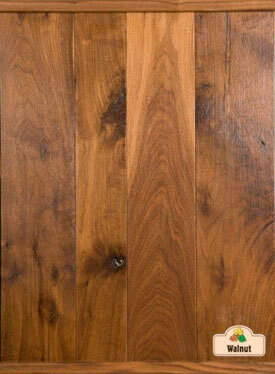 Appearance: Generally straight grained with a moderately coarse, uniform texture. Rich dark brown heartwood and nearly white sapwood. Physical Props: Moderately heavy, hard, strong, and stiff, with good decay resistance and dimensional stability. Working Props: Works very well with machine or hand tools. Sands easily and finishes to a velvety, natural-colored sheen. Uses: Prized in North America for high-end cabinetry and furniture. Ideal for gun stocks due to dimensional stability and ability to absorb recoil. Also used for decorative panels and veneer, interior joinery, novelties, carving, turnery, boat building, clockcases, and musical instruments.